Fall wedding favor ideas can create an atmosphere that is both whimsical and beautiful. Fall is all about delicate leaves turning beautiful colors and drifting to the ground in preparation of winter hibernation. This is the perfect theme for a wedding if you want to incorporate natural colors, ranging from neutral browns and creams to bold oranges and reds. You can easily incorporate pine cones and other natural items collected outdoors to create your own decorative elements, but you will need fall wedding favors to show your guests some appreciation on the big day. 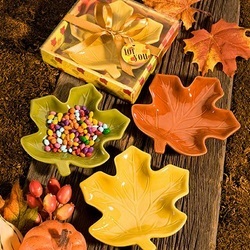 When selecting fall-themed wedding favors, think about whether you want to closely coordinate specific colors or keep your reception hall as lively and colorful as possible. Many favors can double as decorative elements on your tables or dangling from the ceiling. 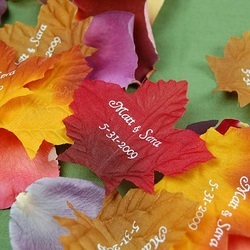 Look below for some of our favorite fall wedding favor ideas for the current year. 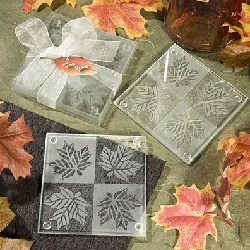 Autumn Leaf Frosted Glass Coasters - Give your guests a safe place to rest their drinks at the reception or at home. These coasters feature four intricate leaves and are made from elegant frosted glass. They come individually wrapped in sets of two, so you can set them out at each place setting or keep them in a basket for guests to pick up on their way out the door. This is a functional wedding favor that your guests will keep for years to come. Fall-Themed Photo Coasters - These coasters are individually wrapped and will add a vibrant reddish-brown color to your décor. They are designed to feature the photo of choice in the center, so you can easily use them as place holders by adding pieces of paper with your guest’s names into the photo slot. The coasters are made from high-quality glass. 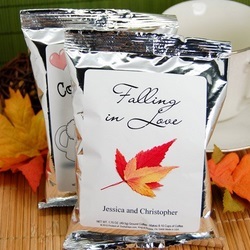 Personalized Coffee Favors - The fall-themed coffee favors feature beautiful white labels with colorful leaves and the words “Falling in Love.” Coffee is contained in elegant bags, and you can select from silver, red or white bags. You also get to personalize the label, so you can give your guests a warm thank you or just celebrate the happy couple’s monogram. 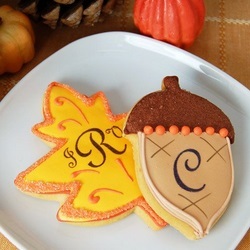 Fall-Themed Cookies – Personalized - Who doesn’t love a sweet cookie? These decorative cookies are shaped like leaves, acorns, pumpkins and an orange wedding cake. They are individually wrapped in clear cello bags and sealed with a decorative ribbon. This is a fall wedding favor that you can hand out to the youngest guests or use as decorative items in baskets or scattered on tables. They come personalized, so you can tailor them to your event perfectly. 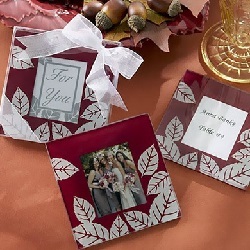 Fall Favor Box Place Card Holders - This is one wedding purchase that will serve double duty for your reception. 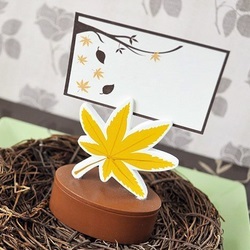 Select the yellow leaf design and get a decorative favor box topped with a place card holder that fits the fall wedding theme. This is a colorful, fun wedding favor that will help your guests find their seats and then reward them with the favor of your choice. You can fill the favor holder with candy, mints or other small items. 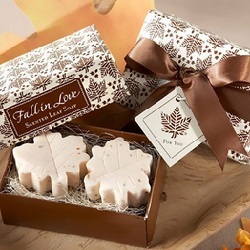 Fall Leaf Soap Favors - Each decorative box holds two adorable leaf-shaped soaps. 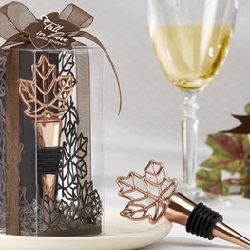 You can reserve these fall wedding favors for special guests or set them out for everyone to enjoy. They are also perfect additions to larger gift bags for the wedding party or parents of the bride and groom. Get creative, and you may even use these soaps as decorative elements for your wedding.